Do you hear that sound? It’s an alarm indicating impending doom. After prolonged speculation that he’d be leaving the court, Justice Anthony Kennedy has made news of his retirement official. “For a member of the legal profession, it is the highest of honors to serve on this court,” he wrote in his resignation letter. “Please permit me by this letter to…” BLAH BLAH BLAH, PLEASE DON’T LEAVE, JUSTICE KENNEDY! As much as I’d like to be able to offer even a sliver of optimism right now, I cannot. There’s no positive spin to attach to this news. President Donald Trump will get a chance to appoint his second Supreme Court justice, giving the right firm control of the judicial branch indefinitely. Sure, in one sense Trump would just be replacing a conservative with a conservative, but Kennedy has gone rogue enough times to give liberal ideology a chance. The moderate has been the most pivotal vote on the Supreme Court for several years now. Serving alongside four liberals and four conservatives, he often had the power to tip the balance on some highly partisan issues. Not long ago, Trump released a list of a couple dozen candidates he’d like to nominate to the Supreme Court, so there’s sure to be a lot of speculation as to which of these people will take Kennedy’s spot. If Justice Neil Gorsuch is any indication, Trump’s choice will bring a far right philosophy to the bench, a huge departure from Kennedy’s more moderate stances. The next judge could very well help eliminate existing precedents that Americans count on as rights. Abortion and reproductive rights will certainly be at risk. The same goes for civil rights and anti-discrimination laws that protect racial and sexual minorities. Furthermore, Kennedy has been hinting that he’d be willing to apply reasonable rules to keep gerrymandering in check, but hope for any reform there is probably gone with his departure. Liberals who would suggest staging a similar stunt to the one the GOP pulled in 2016 are unfortunately up a creek without a paddle. Although they could try to similarly argue that, so close to a major election, Congress should wait to confirm a nominee until after the people have voted, the fact is that Republicans previously eliminated the ability to filibuster judicial nominees. That means that with the GOP controlling 51 Senate seats, Democratic opposition would be unable to thwart a united Republican bloc. 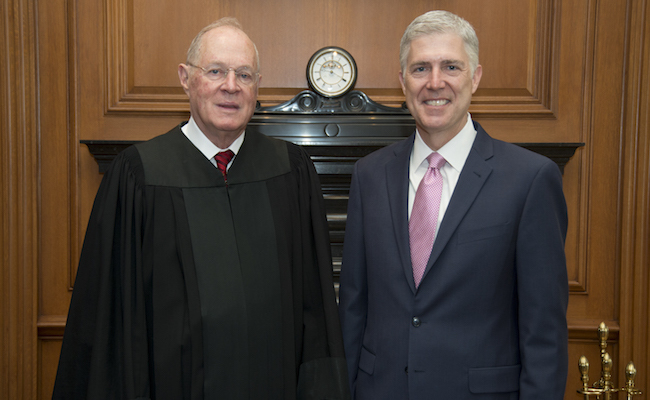 At 81 years old, Kennedy has served on the court for three decades since his appointment by Ronald Reagan. His retirement will take effect on July 31, and Senate Republicans have already indicated they’d like to see his replacement confirmed prior to the court’s next session in October. Worth reading: "On Tyranny" - Twenty Lessons from the Twentieth Century. By Timothy Snyder. -from the back of the book - "The Founding Fathers tried to protect us from the threat they knew, the tyranny that overcame ancient democracy. Today, our political order faces new threats, not unlike the totalitarianism of the twentieth century. We are no wiser than the Europeans who saw democracy yield to fascism, Nazism, or communism. Our ONE advantage is that we might learn from their experience." David C The Democrats lost with a centrist so clearly you're wrong. The Democrats need to go left, allow Bernie Sanders to lead them, and support progressive policies like Medicare for all, free colleges, a $15.00 minimum wage, and marijuana legalization. Clearly people like you who refuse to admit that the Democrats need to change and go left, are the reason they keep losing. this was not a drill when you voted in 2016......and I can forgive you your mistakes, but it is one reason to remember that Blue is always better than red......when voting...â¦. Elections count, Presidential elections can count world-wide and far into the future especially when it comes to SC and other judges.....HRC wasn't perfect, but too many only would accept perfect or felt they needed to protest vote....this is what some get for not being willing to except good enough....you get awful...â¦.and maybe little or nothing you wanted...â¦..sadly too little of this country is actually progressive enough to always vote progressive, most of this country is in the middle and moderate...that is why we have debates on civility, method and compromise is not a 4 letter word like too many seem to say...â¦. this was predicted at least 2 to 3 years ago and it wasn't a drill then...â¦.and RBG maybe next....she's older and already survived what many don't...â¦â¦â¦â¦. "Inside the White House, however, news of Kennedy's retirement didn't come as a shock. In fact, as The New York Times reports, the 81-year-old's announcement was the culmination of a carefully orchestrated 17-month campaign by the Trump administration to remake the Supreme Court before the 2018 midterms, when there is an outside chance that Republicans could lose their majority." I also read this in my local newspaper yesterday. "The left was stunned by the announcement that Justice Anthony Kennedy, one of the decisive swing votes on the Supreme Court, will retire next month, opening yet another lifetime appointment for Donald Trump to fill. "The timing," as constitutional law professor Jonathan Turley said shortly after, "could not be worse for the Democrats": with the Supreme Court filibuster a thing of the past, and at least two and a half years until Trump leaves office, Democrats have virtually no options to prevent the president from naming whichever candidate he likes. "Things look pretty bleak," another legal expert told me. My reply: Her campaign helped pay for the Steele Dossier --and they did our country a favor by doing so. The NRA spent much more of the $30,000,000 it contributed to trump's campaign on spreading lies about Clinton than on defending trump. What does that tell you? And I already proved, with sources, that they did. Russia interfered in our elections --and that's been proven many times over-- to keep Hillary from winning the election. What does that tell you about Hillary? Putin is intimidated by Hillary, while he has trump in the palm of his hand --even at the expense of alienating the allies we've worked hard at maintaining a good relationship with after WWII. Trump knows so little about all the subjects required to be a president. Putin has seized on that. Do you really believe, based on his speeches, tweets, and responses (what little there are) to reporters' questions, that trump is qualified to hold the highest office in the land? I believe that the NRA and Putin put trump in office. If you haven't read the Steele Dossier, I suggest that you do. Based on what you've offered so far, I'm guessing you're a one-issue voter: gun rights. I don't criticize your affection for guns, but it seems to override every other issue that's important to our democracy and to the health and well-being of our country and its citizens. You said: "Obviously our news sources differ on the opinions and facts they present, as evidenced by our differing opinions on relevant issues of the day." My reply: I don't know what or who your sources are --unless, of course, you consider yourself a valid "source." You rarely reference any. Give me a few, and I'll compare them. One exception: I refuse to watch what Fox calls News. After listening to the likes of Hannity, O'Reilly, Carlson, Beck, Coulter, etc., I just can't stomach it. And Fox & Friends? That show is an embarrassment to anyone who can think. Any other suggestions are fine with me. You said: "There is no gain without a little pain." My reply: I'm the one who does all the research! Please don't tell me that there's no gain without a little pain! I mentioned in one of my posts that you've helped me to learn a lot because I feel the need to validate my opinions, which causes me to do a lot of searching and reading. I even visited a gun site and was subjected to the vilest comments against liberals that I've ever witnessed. So, my friend, that argument holds no water. What newspapers or websites do you use to form your opinions? I'd be glad to check them out. You said: "Actually Hillary was the one who PAID Russia for campaign interference. Why aren't we investigating THAT?